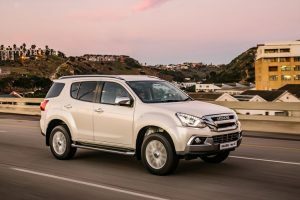 Earlier this year the media attended the opening of the Isuzu factory in Struandale- Port Elizabeth, which was purchased from General Motors, who exited the country last year. They alluded then, to an SUV called the mu-X, soon to be launched as a 7-seater. Well this week the media were invited to put the mu-X through its paces in the picturesque little town called Clarens, near the Golden Gate National Park. Obvious comparisons were going to be made with the SUV from GM in the past namely the Trailblazer. Whilst it certainly bears a resemblance to the latter at the rear, the mu-X is a much more stylish and handsome looking SUV indeed. It is less square and box-like, has less plastics, and also less rattles, which the Trailblazer, unfortunately had. 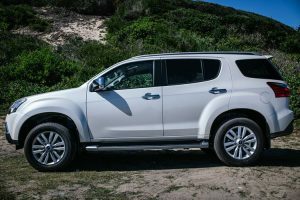 Its more apparent competitors will be the Toyota Fortuner, Ford Everest and Pajero Sport, and it should acquit itself well against them, judging by what we experienced. 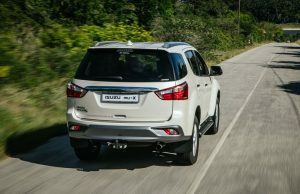 The mu-X is a robust and tough looking SUV, and where it is distinctive, is in the front , where it looks very Isuzu, framing the bold chromed Isuzu front grille are striking headlight clusters that incorporate LED daytime running lights, along with Bi-LED projector headlamps with auto-levelling functionality as standard on both models. This is complemented by low-mounted fog lights that provide additional visibility in difficult weather conditions. Also from the side where the Katana sword is shown in the curve profile. The SUV is good looking and will be at home in the city streets as well as in off the beaten track. The integrated aluminium side-steps enhance the tough exterior look of the mu-X, while facilitating easy ingress and egress for front and rear occupants. Smart double-spoke 18-inch alloy wheels further enhance the dynamic design, as does the sharp styling of the LED rear combination lamps, once-piece tailgate with integrated rear spoiler, and lower rear valance in contrasting grey. Darkened glass is used for the rear side, quarter and tailgate windows, adding comfort, privacy and security for passengers and items located at the rear. The interior is more refined, with some soft plastics, which help make it less cheap. The seats are comfy, but a complaint from my co-driver was that the passenger seat was not mechanised, and with a nearly six hundred K price tag, he had a point. It has a very cohesive infotainment system set in the middle of the dash, which was very easy to navigate and had the Apple Carplay and Andriod Auto functionality, expected these days. It has Bluetooth connectivity, and two USB ports in the front, which came in handy for two journalists needing constant comms. As part of the “Sky Sound” system, a total of eight speakers are mounted in the dashboard, front and rear doors and the roof, thus providing an engaging sound experience for all occupants. An electronic climate control system is standard, accessed via the circular cluster of controls in the centre drop-down centre of the dashboard. Rear seat occupants are catered for with their own cooling vents, ensuring high levels of comfort on short or long-distance trips. The central locking system boasts passive keyless entry and start, along with touch sensor opening and push-button locking functions built into the chrome door handles, contributing to day-to-day convenience, as does the multitude of storage compartments located strategically around the cabin, including dual glove boxes, an upper dash storage binnacle and cup holders for all three rows of seats. Isuzu Motors have long been reknowned for making reliable & quality diesel engines, and have made approx. 25-million engines to date. And under the bonnet of the mu-X is the legendary3.0L four-cylider turbo-diesel engine. 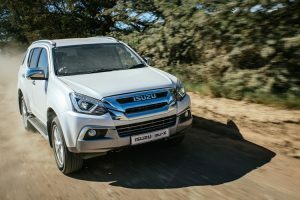 It is not particularly fast, and in the Highveld air, sometimes seemed to lack over-taking acceleration, but it has low down grunt, and comes into its own off-road. It also is quite fuel efficient, delivering 130 kW of power matched to a peak torque output of 380 Nm at 2 000 r/min, this power unit is suited to a wide variety of roles, from relaxed cruising with the family to towing a trailer or caravan, and conquering challenging off-road terrain. The mu-X is exclusively available with a six-speed automatic transmission that gives good power, and it has a manual mode which I preferred, to make the most of the generous torque available. 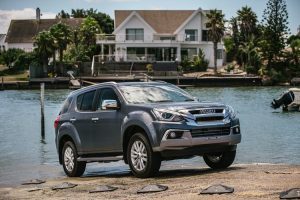 The Isuzu mu-X is available in a choice of rear-wheel drive or part-time four-wheel drive models – the latter featuring Isuzu’s easy to use Terrain Command 4×4 system with electronically selected 2-High, 4-High and 4-Low modes, the latter designed for off-road adventure. Off-road capability is enhanced with a ground clearance of 230 mm, a 24-degree approach angle and departure angle of 25.1-degrees. The extensive underbody protection includes a sturdy steel guard for the sump and transfer case for added peace of mind. 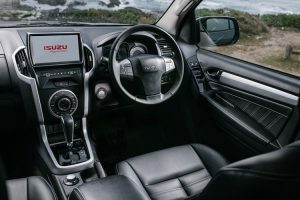 We drove the mu-X through a fairly challenging 4×4 trail in the hills above Clarens, and it handled with aplomb, no getting stuck in mud, or in tricky shale laden acents. The Isuzu mu-X is packed with an extensive range of active and passive safety features. To assist the driver in avoiding a collision, it is equipped with an all-disc ABS braking system with Electronic Brakeforce Distribution (EBD) and Emergency Brake Assist (EBA). Electronic Stability Control (ESC) helps the driver maintain control of the vehicle, while the Traction Control System (TCS) prevents wheel spin and slippage. Hill Start Assist (HSA) provides an electronic brake control that automatically engages to prevent vehicle roll-back when pulling off on steep gradients of more than 5.7 degrees. Designed specifically as an enhancement for off-road driving, Hill Descent Control (HDC) can be engaged in low-range 4×4 mode, applying the brakes independently to ensure a smooth, controlled descent – thus giving the driver added confidence and safety when negotiating difficult downhill terrain. Six airbags are included in the list of standard passive safety features for impact protection in the event of a collision, comprising dual front, side and full-length curtain airbags, linked to front seat pre-tensioner seatbelts. 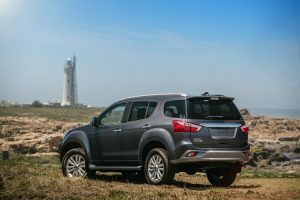 The Isuzu mu-X comes standard with Isuzu Complete Care, comprising a five-year/120 000km bumper-to-bumper warranty and Isuzu Roadside Assistance, a five-year/unlimited km anti-corrosion warranty and a five-year/90 000km Service Plan. Service intervals are every 15 000km/12 months. Extended cover can also be purchased for Roadside Assistance, Service Plans and Maintenance Plans. Summing up, the mu-X should find a steady customer base, as it is a good proposition and is very well priced. It comes with the already enhanced Isuzu build quality, and reliable & powerful diesel engines. It has been updated with media and tech, and it is a nice looking SUV as well.